In 1-quart nonstick saucepan, heat syrup and fudge topping over medium heat until warm, stirring until smooth. Keep warm. In medium bowl, mix flour, brown sugar, baking powder, baking soda, salt and pecans. Beat in buttermilk, eggs and butter with spoon or wire whisk just until blended. Heat griddle or skillet over medium heat or to 375°F. Grease griddle with butter or vegetable oil if necessary (or spray with cooking spray before heating). For each pancake, pour about 1/4 cup batter onto hot griddle. 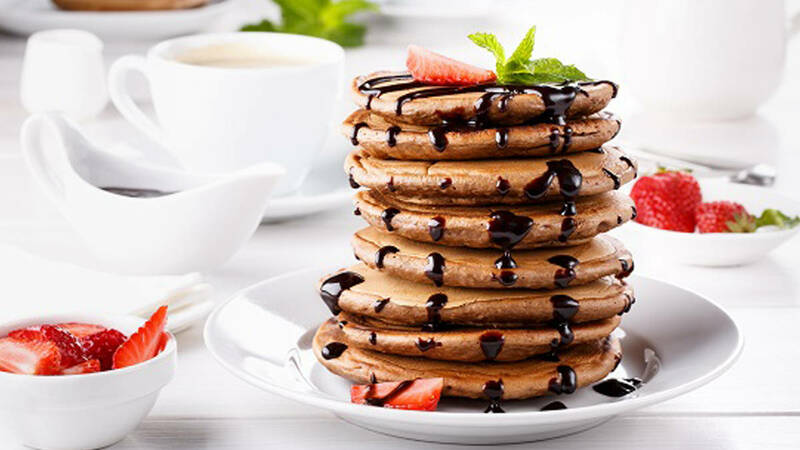 Cook pancakes until bubbles form on top and edges are dry. Turn and cook other sides until golden brown. Serve with warm syrup.